5. The export request has now been placed in a queue. To track progress of the job, and to download the file once complete, please click on the Job Queue button. 7. 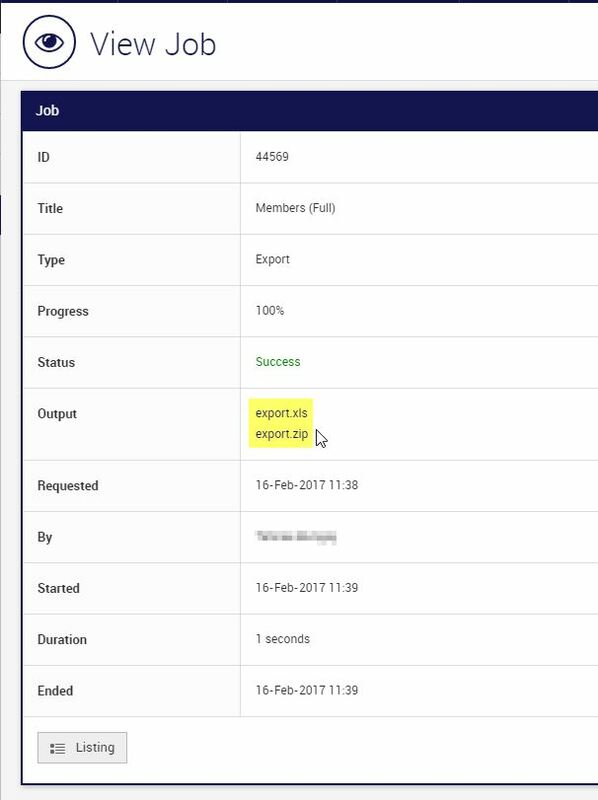 The Jobs screen will provide a list of all export requests by your organisation and it will display the progress of these. 8. Please click Actions > Refresh after a short time period so that the system can refresh and provide the most up-to-date status of the download. 8. Once Progress is 100% and Status shows as Success – your file will be ready to download to your Computer. Please note: The file will be removed after one hour for security purposes. If you have not already saved the downloaded file to your computer this process will need to be completed again (or depending on your computer settings it may be available in your Downloads folder). The Full Export will pull all fields from the Basic Member Export (above), in addition to custom questions and answers. This will be outputted as a spreadsheet divided into tabs based on the Member Type.